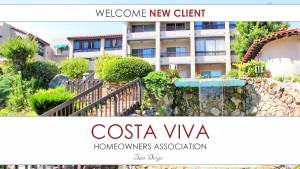 It’s our privilege to welcome Costa Viva Homeowners Association to Tinnelly Law Group’s growing family of HOA clients. Costa Viva is a condominium community located just minutes to Mission Bay in the Clairemont Mesa region of San Diego. Residents enjoy bay views, amazing amenities, and a peaceful neighborhood. Our HOA lawyers and staff look forward to working with Costa Viva’s Board and management.